Byron is the epitome of British style and clothing. As they say, “the British look is to be trim and fitted, but not tight and still very comfortable.” These complex ideas have been implemented and perfected by the British apparel industry through years of trial and error. Although this particular fit is especially popular today, they have always believed it to be the correct and only way to fit a suit. Byron “scrutinizes” each and every detail of each garment to achieve the perfect fitting piece. From the fabric to each stitch, the entire process is monitored to be sure to stand up to the Bryon standard. Ultimately, each jacket is judged by its fit; the British look, the Byron fit. They believe that the proper construction and fit starts in the shoulder of the jacket - the centerpiece of their collections. A shoulder with a natural slope is necessary. Byron’s suit jackets are constructed with a floating canvas chest piece on the lapel and body that slopes and molds to the body. This type of tailoring enables the wearer to “feel” the garment on him. Constructed in a specific manner, Byron creates this type of jacket that still allows freedom of motion and has a concise and compact presentation. 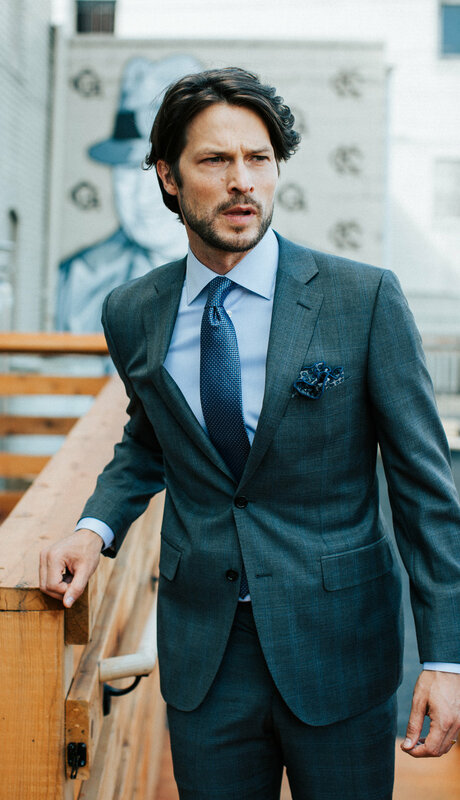 With Suits from $995 - $1195, Sportcoats from $695 - $995 and Tuxes at $995, there is a lot to love about this wonderful brand!